The Place de la Concorde isn't really much of a destination to go seek out; it's more like something you're bound to see from time to time when you're out and about in Paris, and it's cool if you know a little about the history of the place when you see it. This place is the site where the guillotine stood during the French Revolution, and both King Louis XVI and Queen Marie Antoinette (along with countless other aristocrats and assorted rich jerks) totally got their heads chopped off here. The obelisk that stands in the place today is called the Obélisque de Louxor — the Luxor Obelisk — and it originally stood at the entrance to Luxor Temple in Egypt. It was given to France as a gift from Egypt in 1829. 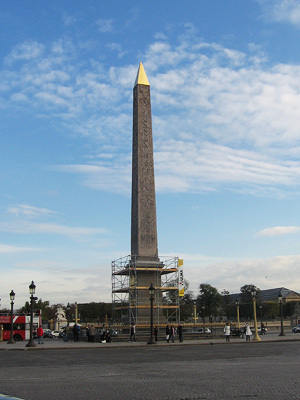 The Place de la Concorde and its obelisk are right smack dab in the middle of the long straight path between the Louvre and the Champs-Élysées. In fact, when you're at the Louvre, try this: In the big courtyard with the pyramid, you'll see a monument that looks a heck of a lot like the Arc de Triomphe, but smaller and with a chariot and some horses on top; this is the Arc de Triomphe du Carrousel. Put yourself underneath this arch and look away from the pyramid, and you'll see the obeslisk of the Place de la Concorde in the distance, and way off beyond that you'll see the real Arc de Triomphe. It all lines up perfectly; neat! Incidentally, you can take a lovely stroll all the way from the Louvre to the Arc de Triomphe, with the Place de la Concorde in the middle; I wrote all about that here. L'Hôtel de Ville — a great place for an execution!